What’s the best vegan ice cream? We taste-tested six dairy-free brands. What’s the best vegan ice cream? 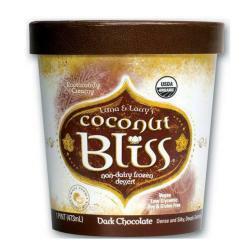 Coconut Bliss, non-dairy frozen dessert, dark chocolate flavor. It’s almost impossible to walk down the street in August without hearing the familiar call of the ice cream truck. The sound brings to mind the endless possibility of summer: lazy Sundays, outdoor concerts, barbecues. For ice cream purists, it may instill the desire to make batch after batch of homemade ice cream. For people like me, though—people who lead lives without milk—it’s a sad reminder of what’s missing from my summer: a good dairy-free ice cream. I grew up in a family with an affectionate but complicated relationship with ice cream. We always marked the first and last day of school by eating it for breakfast—in fact, we celebrated just about everything with it. (What can I say? We subscribed to the Rickey Henderson school of thought.) Yet we also kept kosher, which meant that we had to wait three hours after consuming meat before we could taste any dairy. As a result, we often had to replace our favorite dessert with dairy-free imitations. But the options—Tofutti Cuties, sorbet—never compared to the real thing. And so when I became a vegan two years ago, in addition to giving up French cheese and scrambled eggs, I virtually abandoned my favorite food. But the dairy-free frozen-dessert aisle has changed since my childhood, and that can only be a good thing. As Mark Bittman noted in the New York Times last month, the numbers of Americans abstaining from milk—whether for reasons of veganism, lactose intolerance, or health problems exacerbated by dairy—has been growing. Not surprisingly, the number of dairy-free ice cream options has also increased. With another summer halfway done, I decided it was time to give dairy-free ice cream another try, so I enlisted five family members to help me remedy this lacuna in my diet. While New York City has some great local options, we aimed to only use national brands. (My super-scientific methodology: I went to the Whole Foods closest to my parents’ house in New Jersey and grabbed the six most appealing sounding pints that didn’t have “local” stamped on them.) I tried to diversify the bases—soy, coconut, and various nuts being the most common—and in order to ensure that we were judging the ice cream, not the flavor, we stuck with chocolate for each. We had three main criteria: taste, texture, and simplicity. While it’s safe to say no vegan alternative will taste exactly like ice cream, there still should be an appealing flavor independent of the base. (An ice cream made from coconut milk shouldn’t taste exactly like frozen coconut milk.) As for texture, it’s not called ice cream for nothing—rich smoothness is essential to a frozen dessert’s appeal. And by simplicity, I’m referring to the number of ingredients contained in each pint. Perhaps I’ve been overly influenced by the marketing for Häagen-Dazs Five, which boasts just five ingredients (three of which are verboten for vegans), but no one wants to eat a chemistry experiment. It took some convincing to get my family to try this hemp-based frozen cream. According to Living Harvest’s website, the idea to use hemp as a dairy alternative originated over a decade ago at the University of Saskatchewan. “These enlightened Canadian researchers discovered the protein potential locked within the hemp seed,” Living Harvest enthuses. “The balanced combination of essential fatty and amino acids provided a nutritional profile unlike any other vegetable.” This may be true—I’m not an expert on the nutritional profile of vegetables—but it didn’t stop my family from cracking some hippie-themed jokes and asking whether you could smoke the ice cream from a bong. We didn’t try, but it might have tasted better that way. Given Tempt’s uncreamy, jagged texture, there was a general consensus that eating it was about as fun as eating chunks of freezer burn. And while the first bite was tolerable, it left a disturbing aftertaste. Strike three? It contains more than 15 ingredients, including carrageenan—a vegan alternative to gelatin that is somehow extracted from seaweed—and organic agave inulin. When I tried to figure out what this was I got bogged down by charts and words like fructans, but from what I can tell it’s another plant-based additive that supposedly adds flavor. It didn’t do a good job. Conclusion: Tempting it is not. Coconut Bliss was the first of the two coconut-based ice creams we sampled, and it tasted overwhelmingly like its base, which was not a positive for the coconut averse in our group. (“It tasted like macaroons, and not the good kind.”) Even for those of us who liked coconut, the taste was overwhelming. The texture, on the other hand, was definitely a step up. Also, Coconut Bliss contains only four ingredients (or six if you break down the coconut milk into its component parts). This was a definite plus in theory—take that, Häagen Dazs Five!—but I can’t help but think that an additional ingredient might have improved the flavor. Conclusion: Coconutty yes, blissful no. If we were grading based on packaging, we’d have a winner. But no one buys ice cream for its sleek, minimalist design, and aside from the classy container, Cashewtopia was the biggest disappointment. Like all of Organic Nectars’ products, Cashewtopia is made entirely of raw ingredients—or, more precisely, ingredients that haven’t been heated above 118 degrees. (This ostensibly preserves foods’ maximum nutritional value.) I can’t say whether the cashews would have benefited from being cooked, but they definitely could have used another round in the blender to address the grainy consistency that felt absolutely nothing like cream on the tongue. The taste was also overwhelmingly nutty: more of a cashew-chocolate flavor than a purely chocolate one. And while all the ingredients may have been raw, there were still 12 of them. Since soy is king of nondairy milks, you’d think soy-based ice cream would make a strong showing—but alas. Purely Decadent comes from Turtle Mountain, the company that also makes the coconut-based So Delicious (about which more below). The pint we chose was sort of a cheat because it had chunks of chocolate mixed in to it. (Turtle Mountain has an apparent fondness for mixing various solids into its frozen desserts.) In the end, the chunks worked in its favor, disguising the fact that the consistency and texture were off—we got the distinct feeling that the chocolate chunks were the only thing holding it together, since, as one family member pointed out as he went to take a second bite, it melted surprisingly quickly. Still, the rich, chocolaty taste was unanimously praised. Yet, with its disconcerting texture and more than 15 ingredients (including carrageenan and algin, an extract from kelp), Purely Decadent left much to be desired. This company dreams big: It also puts out Soy Dream, Coconut Dream, and Rice Dream frozen desserts. And its dreams appear to have paid off; one of the oldest nondairy ice cream producers, the company has been going strong for over 40 years. They seem to have taken advantage of that time to hone their recipes. Almond Dream was one of the chocolatiest ice creams we tasted, though it still smacked slightly of almonds. Its texture was also surprisingly smooth. (Cashewtopia, start taking notes!) If only the ingredients were a bit more appealing: There are more than 10 of them, and the second one is evaporated cane juice—plus our old friend carrageenan pays a visit. Conclusion: Dream almost come true.